Spent some time today modifying the I/O mapping of the OSCA emulator to bring it fully up-to-date with the latest release (v6.64 at the time of writing this). In terms of some of the other newer features of OSCA (video support mostly – 8×8 tilemap mode, wide chunky pixels etc. ), this functionality has not yet been incorporated, but is next on the list! 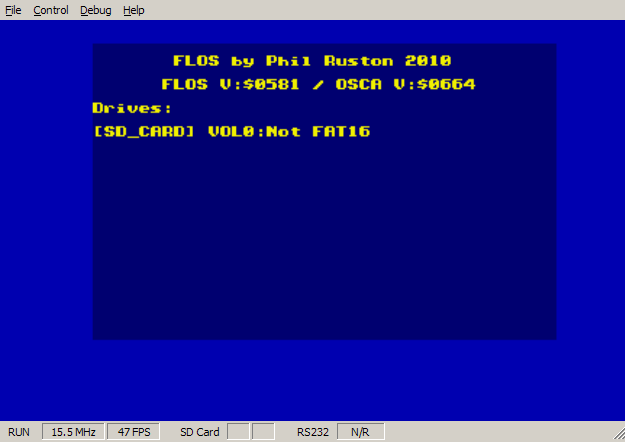 Obligatory screengrab above shows 6.64 successfully booted in the emulator. On a side-issue, this now means that Daniel’s awesome loopback demo now shows the intro screen, but it then goes into a loop waiting for something… not sure what yet! Video IRQ was not implemented fully (and therefore disabled) – I’ve corrected this now (with some possible gremlins to work out). I also (partly) added the LineCop – it doesn’t work yet when the registers are mapped out. My guess is that it was waiting on one or more of those to proceed. Now I get the intro credits followed by an almighty (and I mean almighty – CPU grinds to a halt almost) fail when it reaches what should be the title screen haha. It’s progress, but for now I’d prefer to focus more on the core video system first before troubleshooting this any further.